With the spring, along with often warmer weather, comes a rise in the risk of eye injuries related to sports. Each year, many people, both young and old suffer sports related eye injuries that could easily be averted with suitable defense. Using proper eye protection while participating in sports is important especially in high-impact sports or those that bring you out into the sun such as ice hockey, softball, lacrosse, badminton, wrestling, water polo, or fishing. Most sports related eye accidents can be prevented by wearing the appropriate protective eyewear best suited for the activity you might be involved in. The right eyewear will keep you out of harm's way and will often also have additional protection to minimize your exposure to harmful UV light for when you're outdoors. Sports eyewear is designed especially to prepare you for common conditions. Everyday glasses typically don't meet the minimum requirements for preventing impact, meaning that a minor tumble can mean a serious sight-threatening injury. Eye safety goes beyond using the correct protective eyewear. Your vision is an important factor of your ability to perform, so you must have clear vision. For people who ordinarily wear eyeglasses, you'll need protective sports glasses that have a prescription, so you can see properly while you play safe. If you're fitted with contacts, you might need a slightly different lens than the ones you wear on a daily basis. 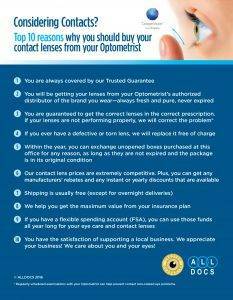 Speak to your eye care professional regarding the choices available to you. Each sport has differing demands and dangers, so let your optometrist identify your specific situation and suggest the right glasses or lenses best for your eyesight needs. This is key in helping you get the edge that'll help you succeed and enjoy sports safety. All sports have different needs and risks, so it's important to let your optometrist determine your unique needs and provide the correct eyeglasses or contact lenses best for your vision. This will only help you have the edge you need to excel and have fun safely.